San Francisco is booming and continues to attract people who want to work, live or study in the area. While living within the city limit has its benefits: shopping, dining, plenty of entertainment options, if you’re looking for a little more room or a slightly slower pace of life, it’s worth expanding your sights to the surrounding cities. There are a lot of great cities and neighborhoods that are driving distance to San Francisco and other employment centers that will offer you something that’s hard to come by in San Francisco: space. Whether you’re new to the area or are looking to snag a little bit more room for your family, here’s why you should consider looking eastward across the Bay Bridge to the East Bay. Contra Costa County is a hub for arts, culture, adventurers, and food lovers. The Bay Area is home to several climate zones. While its overall Mediterranean climate means it’s temperate year-round, the East Bay is consistently warmer than San Francisco, meaning you get to enjoy all the outdoor activities like biking, hiking, camping, horseback riding, running and more. 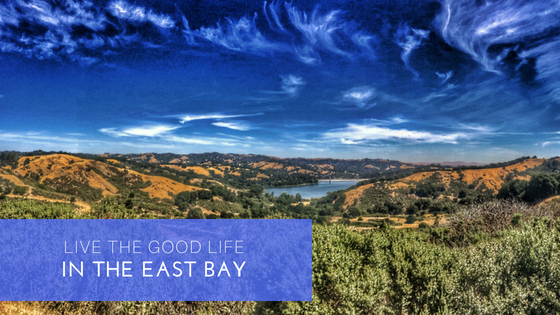 There’s plenty to love about Contra Costa County. Nature is a common passion in East Bay residents, who enjoy access to 65 parks in over 100,000 acres, including more than 1,200 miles of trails at perennial favorites like Tilden Regional Park and Diablo Foothills Regional Park. Contra Costa County is also within an hour’s drive to the coast, a few hours from the Redwoods in the north, and about a half-day’s drive to Yosemite National Park. There’s also a plethora of dining, shopping and entertainment options as well. Not only is there great shopping and dining options within the Lamorinda corrider (Lafayette, Moraga and Orinda), there’s endless possibilities in nearby Walnut Creek, Oakland and Berkeley. You can enjoy the same level of fun in San Francisco in your own neighborhood! Have we convinced you to call Contra Costa County home? We don’t blame you! In fact, we’ll be opening a new community in Moraga soon! Bellavista, located on Rheem Boulevard in central Moraga, is an exclusive enclave of 27 single-family homes with stunning views of Mount Diablo, pastoral rolling hills and open space. Our single-family homes feature 4 to 5 beds, 3.5 to 4.5 baths and approximately 3,131 to 4,813 square feet of living space. With ceiling heights up to 12 feet open, bright floor plans and finishes with contemporary designs, you’ll feel like you’re living in a dream. There will be some single-level options, California rooms, Thermador appliances, tankless water-heater, Anderson windows and more. Bellavista is close to stellar schools including Rheem Elementary, Joaquin Middle and Campolindo High. Residents also enjoy easy access to great parks and trails, BART stations and Highway 24 for commuting, and great shopping and dining. We encourage all interested buyers to sign up today for our interest list to stay updated on pricing, floorplans and future sales releases and news. Stay tuned for more information as we get closer to the grand opening. To learn more about Bellavista and schedule an appointment, email us at bellavistasales@shhomes.com or call 888-858-1367.